A new platform's trying to rethink the way people sound off on civic issues online. Earlier this year, a team with ties to some of the biggest social media platforms launched a new smartphone application — “Brigade” — that’s pitched as a way to increase civic engagement and give people a new forum for sounding off on policy issues. Brigade has since piloted a new feature called “Ballot Guide” focused specifically on municipal elections in two cities —San Francisco and Manchester. The guide itself includes a countdown to the Nov. 3 municipal elections, a link to find out where you can vote and tabs that let you “recommend” candidates for seats up and down the ballot – mayor, welfare commissioner, alderman and school committeeman. 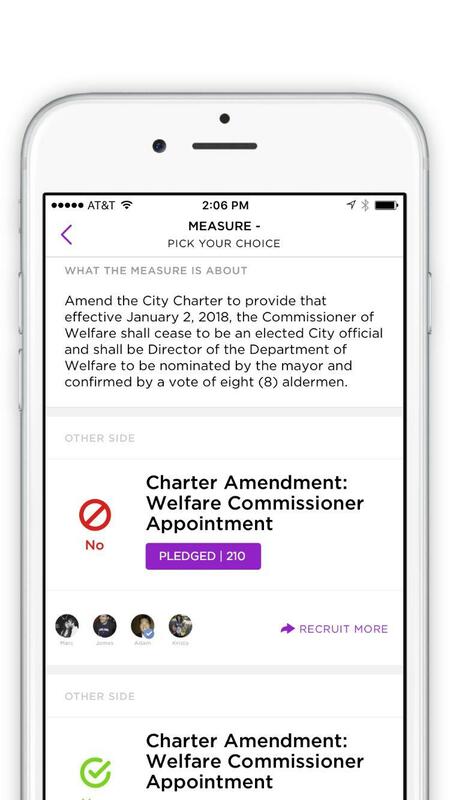 Users can also “take sides” on a charter amendment on proposed changes to how the city’s welfare commissioner is selected. When looking at where to pilot their new “Ballot Guide” feature, the team at Brigade narrowed their initial pool down to a list of 53 cities with populations of at least 100,000 where a mayoral race was underway this year. They settled on Manchester, in part, because of New Hampshire’s reputation for political savviness and because of the potential to expand upon this initial pilot in the year ahead – during the presidential primary, the state primary and the general election. Matt Wilson, who oversees partnerships for Brigade, is working with a few local political groups to try to build buzz around the app. Those enlisted to help with the local launch include the Manchester Democrats and Republican Committee, the New Hampshire Building and Construction Trade Council, the New Hampshire Young Republicans and Emily’s List. The app’s also partnering with the University of New Hampshire-Manchester. Stephen Pimpare, a lecturer on politics and policy at the school, welcomed Wilson as a guest speaker for one of his classes and said he’s optimistic about the app’s potential. “I’m especially hopeful it will create a space for our students and other folks in Manchester to have more thoughtful discussions about politics and policies than what they might be having on Facebook or elsewhere,” Pimpare said. On a broader level, the app also lets people post stances on issues – both silly and serious – and weigh in on the opinions others have posted. 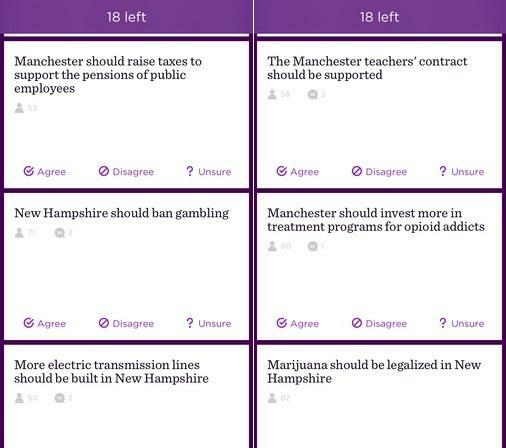 One New Hampshire-specific post, for example, states: “New Hampshire should keep its first in the nation primary.” Others touch on partisanship within the state legislature, the prospect of legalized gambling, the construction of electric transmission lines and funding to address opioid issues. Brigade also has other features meant to prod people to become more civically engaged. On Election Day, for example, you can opt to send an alert to friends letting them know you voted. Once people take positions within the app, there are also ways for them to connect with other people nearby who might hold similar views – or to have a more structured discussion with someone who holds an opposing view. So far, the app’s local base of New Hampshire users is still a little sparse. The app team couldn’t provide an updated count on the number of people using it in the area, but Pimpare is hoping to see that base expand in the weeks and months ahead – once more people sign on, he said, the more robust the conversation will become. 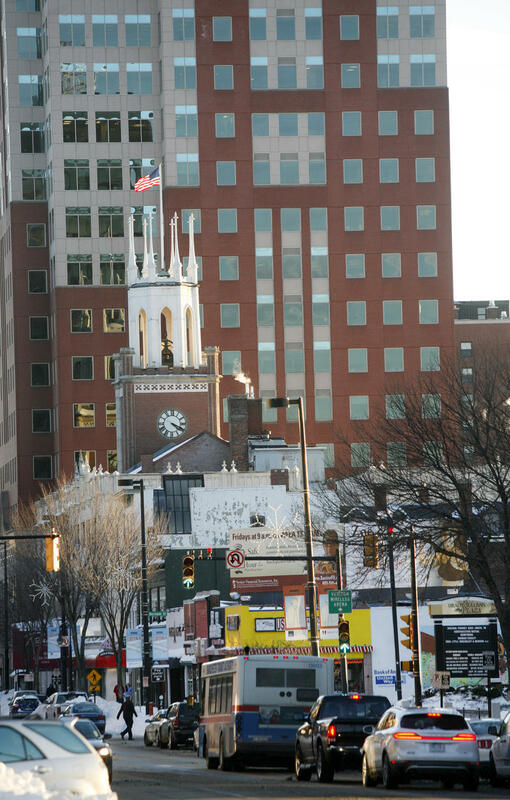 With presidential campaigns in full swing across New Hampshire, it’s easy to forget that municipal elections in several cities are just a couple weeks away. 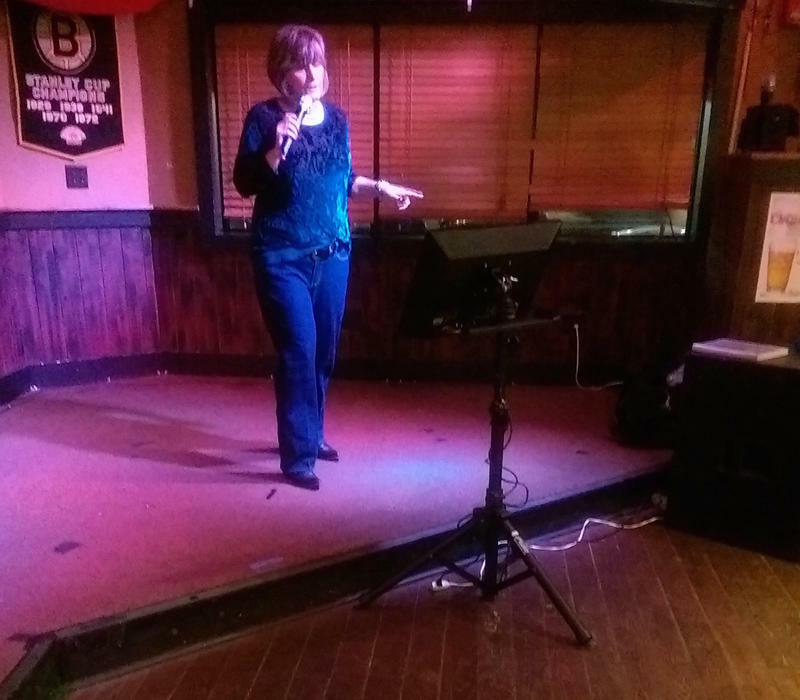 One candidate in Manchester recently came up with a novel way to try to get the attention of potential voters — a karaoke contest. Ed Sapienza, the impresario for “candidate karaoke night," took his turn with a Lou Rawls song. And no, the romantic balladeering was not a shameless attempt to court voters in his bid for Ward 8 alderman. Voters in Manchester go to the polls Tuesday for a primary election that will narrow down a field of five candidates for mayor that includes, most prominently, the three-term incumbent Ted Gatsas. Contributor and former city politics reporter for the Union Leader Ted Siefer spoke with NHPR's Peter Biello. First of all, the current mayor, Ted Gatsas, is a well-known political figure in the state and won his past three elections by comfortable margins. Is he considered vulnerable this time around? The technology sector was once considered just a small player when it came to donations for political races, but that’s changing. In the 2012 presidential and congressional elections, donations from technology elites came in second only to oil and gas. Now, more than a year away from elections, Silicon Valley is already getting behind the candidates – some more than others. Here & Now’s Robin Young speaks with Arik Hesseldahl of Re/code to find out who’s leading and with who’s money.